Bring chicken broth and milk to a boil in large saucepan. Stir in grits and salt; return to boil. Cover and reduce heat to low. Cook 5 minutes until thickened; stirring occasionally. Stir in cheddar cheese. Keep warm. Cook bacon in skillet until crisp; drain all but 2-3 tablespoons of fat from skillet. Add peppers and onion; sauté vegetables with creole seasoning, salt, pepper, and one teaspoon granulated garlic. 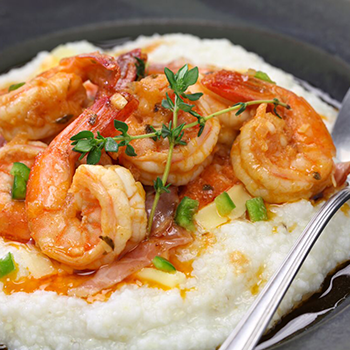 When vegetables are tender; add peeled and deveined shrimp and cook until they turn pink. (Approximately 2-3 minutes). Omg, my only regret is that I didn’t try this sooner!! Where has this been all my life! ?!? DELICIOUS doesn’t begin to describe it. I turn the hot sauce way down, just a little for flavor, no heat, or omit it. Other than that, I have a wonderful new, and easy recipe!!! Thank you!!! !